It’s never too early to start looking at your career and salary possibilities. Your future career and salary affect your current financial aid opportunities, like what grants and scholarships you can apply for, or if you qualify for any loan forgiveness programs. To become a family nurse practitioner (FNP), you will need at least a master’s degree, and you may find that your advanced education can lead to greater employment and salary potential. Job responsibilities, licensing, and certification required for FNPs vary with each state. Therefore, it is important to research your state’s criteria to verify that you can lead other nurses and help patients as an FNP. Many FNPs are similar to primary care physicians in that they can provide care and prescribe therapies to their patients on an ongoing basis. This can give you the opportunity to teach your patients and their families about preventative medicine and healthy lifestyle choices, and follow up with them as needed. All of the following career and salary data comes from The Bureau of Labor Statistics (BLS). This is to ensure that the information we provide you with is as accurate as possible. Since much of the career and salary data is similar for many of the NP and APRN specialties, the BLS does not have separate findings for each sub-field of advanced nursing. The way we deliver healthcare is rapidly changing due to legislation that has allowed more people the opportunity to have insurance. In addition, an aging baby-boomer population makes this is an excellent time for you to become an FNP. The BLS graph below illustrates the projected percent change in employment of APRNs from 2014 – 2024. As you can see, the APRN field shown above is projected to grow 31% in that time frame. This is a much faster estimated growth than the total of all occupations or even other health diagnosing and treating practitioners. Another attribution to this projected career growth is that many states are changing their laws to expand the scope of work that an APRN is allowed to perform, such as removing the need for unnecessary supervision and the ability to prescribe medications. The BLS combined the career outlook data for a large portion of APRN and NP careers. However in regards to overall salary potential, there can be vast differences between the different APRN and NP fields. It is important to note that all of the salary data presented here is from the BLS, and may only apply to NP fields like family, geriatric, adult, and women’s health. 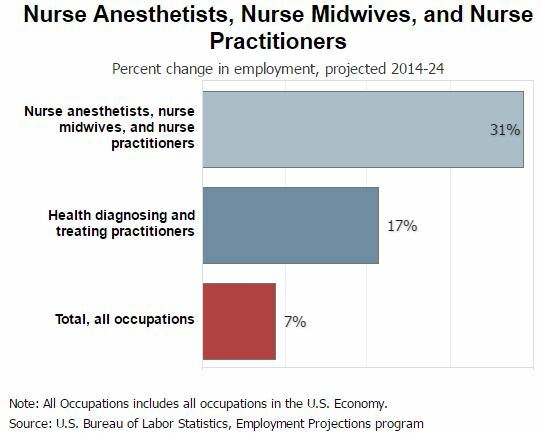 The BLS lists salary potential for nurse midwives and nurse anesthetists separately. Your overall salary potential as an FNP or in any other NP field is dependent upon factors such as education, experience, and location. As of 2015, the average annual wage for nurse practitioners is $101,260. Keep in mind that the BLS lists the average NP as having a graduate-level education, and their salary figures represent the average NP population. If you are interested in pursuing additional nursing certifications or a Doctor of Nursing Practice (DNP), you may open yourself up to an even higher salary than listed here. Yes, NPs are needed all over the country. However, like most occupations, they do not receive the same average salary nation-wide. Some states may offer higher salaries for a variety of reasons ranging from greater demand to higher cost of living. As always, it is important to do your research if you are considering moving to a new state for a possible job opportunity. These next five states are reported by the BLS as having the highest average salaries for NPs. While becoming an FNP is more about helping people and advancing the field than it is about money, doing your research never hurts. 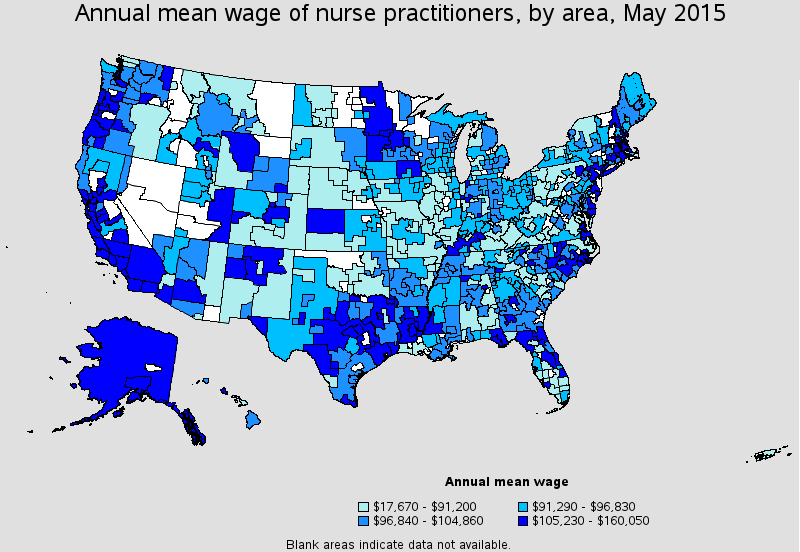 Now that you know which states have the lowest and highest average NP salaries, take a look at the BLS map below to get an idea of the annual mean wage of NPs of specific areas in the United States. The locations in darkest shade of blue were reported as having the highest annual salaries on average for NPs in 2015. It is important to remember that these figures are average salaries of the entire NP field, and are here to help you plan (and hopefully get excited about) your future. As an FNP, there can be career opportunities for you in every state, and there’s a good chance that you may be offered a nice salary in the city, the suburbs, and anywhere in between. Check out our guide, Fantastic Family Health Resources, and the rest of our website for more resources to help you become a family nurse practitioner.